Ewedoos Yoga Mat Bags were the first ever made in the world starting in 2006. 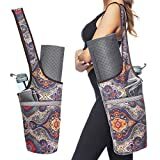 Our bags are known for their high quality construction, durability, and for being available in a vast array of designs and colors, making them unique in the yoga market. They are expertly crafted in India from an exotic assortment of fabrics with centuries-old traditional patterns and embroideries. There is a bag for everyone. Be gentle with washing, whether by hand or machine and avoid the use of bleach to preserve the nice colors – turn the bag inside out before washing to protect the embroidery. Avoid hot water or tumble drying to prevent shrinking. Simply hang dry it, away from direct sun. Note: Yoga mat is not included. Multi-purpose: Whether you are looking for specialized yoga bags and carriers or just a simple gym bag, we’ve got you covered! Our carry bags can double as sports bags, shopping bags, beach totes and even diaper bags. As a bonus, they are great gifts for all yoga enthusiasts! Two Pockets Design: One LARGE Side Pocket for Water Bottle, Towel and Sunglasses. And One SMALL Interior ZIPPER Pocket for Keys, Wallet, and Phone. Quality and Durable Material: Made from high quality cotton canvas, this shoulder gym tote bag will accompany you for the many workouts have yet to come. The WIDER size and the LONGER strap make its carrying easy, without tiring your arms and shoulders. 100% Satisfaction Guarantee: If you are not completely satisfied with our Yoga mat bag, we will do whatever it takes to make sure you are happy! 100% satisfaction or your money back. The yoga mat bag is available at a low promotional price for a limited time only!